While much instructional time focuses on building children’s vocabulary, a new study from the University of Washington College of Education provides evidence that truly “knowing” a word means knowing how to use it. Professor Deborah McCutchen, the paper’s lead author, said the intervention focused on putting vocabulary into action, with particular attention on helping students understand how to use new vocabulary in their own writing. Over 12 weeks, instruction focused on a broader understanding of how words work, rather than a specific skill for growth such as spelling. Learning objectives ranged from gaining insight into the morphological structure of words to applying that insight when encountering and producing complex words in text. Students who received the intervention were much more successful at manipulating words to adjust to existing syntax (e.g. Students were asked to complete a sentence by changing an underlined prompt word: “memory: The party was _____.”). Additionally, there were significant (though somewhat smaller) effects of treatment on items with non-instructed words. The intervention had a significant effect on students’ ability manipulate both word- and sentence-level syntactic features during more self-directed sentence generation. The treatment effect was seen in sentences containing both instructed and non-instructed words, providing evidence that the instruction prompted students to apply their morphological knowledge to words that were not specifically practiced during the instruction. “Our findings suggest that instruction that emphasizes morphology can provide an effective strategy for practice in producing more complex sentence structures,” McCutchen said. 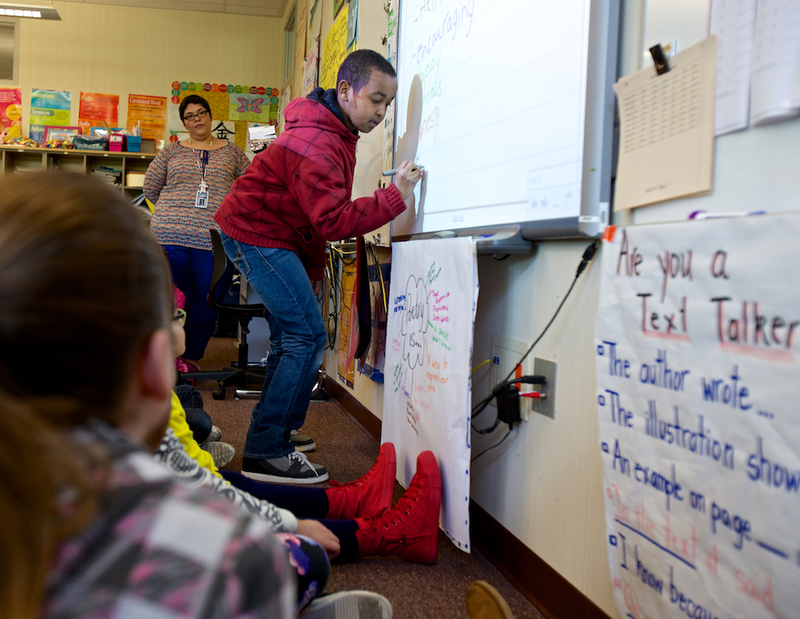 "What we find particularly exciting was the results generalized not just to the words we instructed, but to words we didn't teach the students, so they were able to take our instruction and begin to generalize their understanding of how words work." To help teachers implement the intervention within the schools, the UW team developed materials that embedded morphological instruction within broader reading and writing activities. "Teachers were very appreciative because with the new Common Core standards there is an emphasis on teaching students morphological skills and teachers often report feeling ill-equipped to do that," McCutchen said. Students and teachers were provided with a curriculum packet for each week of instruction and word families were introduced within the context of three different themes: neighborhoods, space exploration, and Lewis and Clark. For example, students were introduced to the word family “function” (malfunction, functional, etc.) on a space exploration week, and to the word family “reside” (residential, residence, etc.) on a neighborhoods week. Students repeatedly encountered and practiced speaking and writing different forms of the word families by reading passages, responding to comprehension questions, practicing sentence-level writing and responding to prompts with extended writing. Weeks four, eight and 12 were used for reviewing vocabulary, encouraging playful use of words and morphemes, and highlighting morphological insights and strategies. At the end of each review week students had the opportunity to use instructed words in longer responses to text. "One thing that's striking about this work is that it shows one doesn't have to take an either-or perspective of focusing on grammar or on students expressing their voice via their writing—you can merge the two," McCutchen said. "You can help children see the connection between understanding how words work and help them express their ideas at the text level."